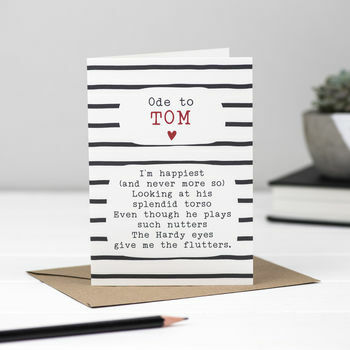 Amuse a Tom Hardy fan with our funny Tom Hardy poem card. Please note: the poem is the copyright of Bespoke Verse and cannot be reproduced without our permission. This Tom Hardy poem card is A6 portrait - the inside is blank for your message. The poem card is printed on FSC accredited 300gsm card. The envelope is kraft (recycled brown).